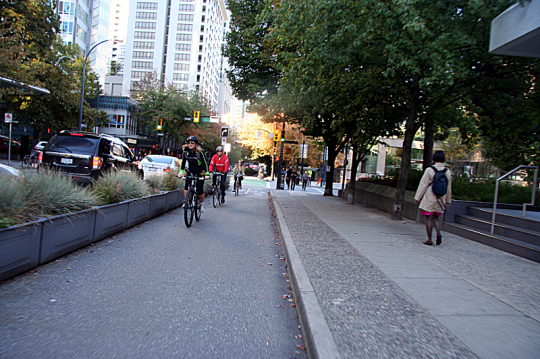 Here’s a group of business owners who understand the power of safe, multi-modal city streets. Michael Andersen at Bike Portland is reporting that, rather than squawk over the potential loss of parking, a group of business owners on Portand’s 2nd and 3rd avenues is actively lobbying the city for protected bike lanes that would remove space for motor vehicles. Elsewhere on the Network today: Voice of San Diego reports on a new study finding, naturally enough, that trolley stations in more densely populated areas see higher usage. BikeSD slams USA Today for its baffling assertion that San Diego, which locals say is a dreadful place to bike, is one of the top 10 most bike-friendly cities in the U.S. And after spending some time on Amtrak’s state-subsidized Pacific Surfliner route, Richard Layman at Rebuilding Place in the Urban Space is convinced a little extra investment in comfort can help make passenger rail competitive.